Learn some idioms about fish. A: How is the project going? B: Slow. There is so much red tape to deal with. B: I know. It’s like swimming up stream. A: Well, don’t give up. A: So how’s business going? B: Not, good. I owe a lot in taxes. B: Let;s just say a lot, and I have to pay. A: Oh no! Sounds like they got you by the gills. A: Did Bob pay you the money he owes you? B: No, but he said he would pay me later. A: He has the money. Don’t let him fool you. B: I know. I need to be more firm with him. A: You do! Don’t let him off the hook. A: Are you coming to the meeting? B: I can’t. I have to finish this project. A: But this meeting is important. B: I know, but right now I have bigger fish to fry. A: Did you see Sue today? B: No, she called in sick. A: Huh! I saw her having lunch with David Smith. B: David Smith! our main competitor! A: Yeah, something seems fishy! Learn vocabulary from the lesson!! When you swim up stream, you swim against the current so swimming is very difficult. This phrases means to do something that is difficult because of some kind of interference. 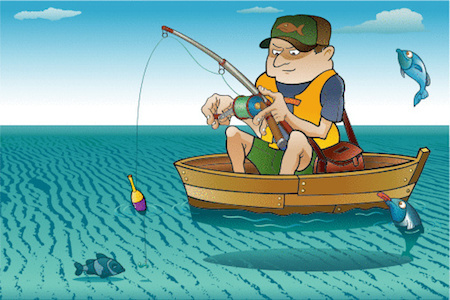 After a fish is caught, fisherman pick it up by the gills, the open area by its mouth. This phrase means that someone has you trapped or won't let you do as you wish. When you have bigger fish to fry, you are worried about one particular situation, and do not have interest in other matters that other people are concerned about. When something is fishy, that means it is strange or not right. You have a bad feeling that someone is hiding the truth about a situation, and you suspect something is wrong. Got me by the . Let him off the . Have bigger fish to . That seems a bit .